Copyright © 2019	LynKel . 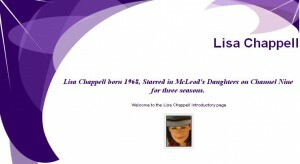 In May 2002 we launched our very first Lisa Chappell site, hosted on a free site with tripod. Shortly after we opened an MSN Group so that we could have a message board and member interaction. Over time we did many alterations to the site and moved to a new tripod site in May 2003 so that we could have Lisa in the site name title. This site was lisachappell2.tripod. With the restrictions that free sites have one of our biggest issues was bandwidth, we didn’t have enough! Subsequently the site spent more time offline than it did on. We did another site redesign, and started looking into domain hosting etc. We researched a lot, and talked to a few people about hosting options. And in May 2004 we finally moved to our very own domain, lisachappell.net. In October of 2005 we decided it was time for a MAJOR re-design. This time we took the full leap into HTML coding. The entire site has been designed in notepad and topstyle css. Along with a few scripts for features. We used Adobe and Paintshop for graphics. In September 2007 we decided again it was time for an ‘update’. Again we have tried to keep the site easy to navigate, but also this time we have designed it in a way to make it easy for us as the webmasters to update it more regularly. The site is constantly being updated, and we like to think it is always still a work in progress. It is fun to constantly dig up more material, and design more things for the site. Although this site is a site for fans, it has been created out of many hours of work, and all information has been collated by us, or given to us from various sources, therefore we would ask that you contact us before using anything on other sites. 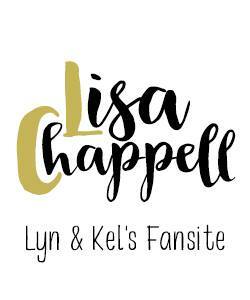 In 2013 our most important change came about when we teamed with Lisa so that she could have her own Official site on the www.lisachappell.net which would incorporate our fansite. The site has had many many looks over time, unfortunately we did not think to capture them all. However we did capture some of them. Below are captures of some variations on what the site has looked like in the past. Click on the thumbnails to see the full picture. An introductory page we had on tripod. We would like to give special thanks to Lisa for all that she has done, not only for this site, but for us also. You have been an inspiration, not only to us but to many people. You are a truly wonderful person, with a golden heart, and amazing talent and we hope to have captured even just a tiny bit of this in our site. We would also like to thank the special people & friends that we have met along the way, you know who you are & you know how special you are to us. You have all helped us through, and given us the strength it takes to be where we are today, some we have known for a long time, others for a short time, but you are each very special to us. Thank you. Thanks also goes to all the different people we have dealt with over the years, in regard to information for the site. The TV stations, not just in Australia but overseas as well. The many promotional people in TV, magazines, production houses and charities etc. Different producers of shows. Everyone we have dealt with has been so very wonderful and helpful. Without these people we could not have brought all this information to the fans. We need to also give a big thanks to ICDsoft… our web host. They without a doubt are fantastic and we would recommend them to anyone! There technical support is second to none, and they have been known to go above and beyond the call of duty to help in anyway they can. Thanks for the heads up on this one Kurt. We talk transformation with Kiwi actor Lisa Chappell, who effortlessly mixes glamour and relatability. Wonderful audio interview with Lisa. Sounds like she is having a blast on Shortland Street - The Musical. Despite some earlier trepidations, she is enjoying it so much! "and acting veterans Lisa Chappell and Mark Hadlow command the stage with strong performances." Copyright © 2019 LynKel .